Acroyoga is a playful way to gain strength and flexibility while improving communication skills and building trust in yourself and others. Physically, it is an exploration of static poses and dynamic transitions that involve at least two people, at least one of whom is not in contact with the ground. Socially, it encourages cooperative problem-solving. • Each child must be accompanied by an adult. AcroYoga is a fun and healthy way to connect and play together as a family. 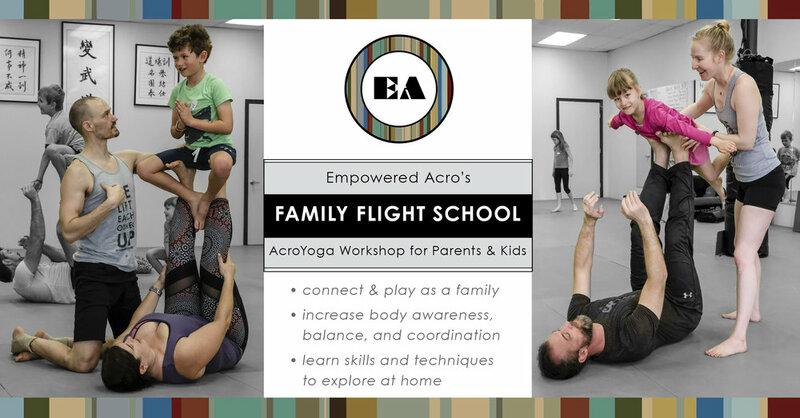 Join us for Family Flight School: AcroYoga Workshop for Parents & Kids. to explore safely at home. - Please register in advance to secure your spot. - Registration is only valid for the date you reserve. - Events with insufficient enrollment may be canceled; Registrants will be notified at least 24 hours prior to class time and refunded.